Do you guys remember when I made this cheesecake? I was over the moon... it was the best cheesecake I had ever made... and it had me wanting to make more. But I wanted to change it up. While I loved the first cheesecake I made, it was a little bit too much for just Tyler and I. It called for three bricks of cream cheese, and we really don't need that much cheesecake for just the two of us. I wanted to accomplish two things. One, buy less ingredients, which would save money, huzzah! Two, make less cheesecake, which is easier on our waistlines, ha! ;) A friend of mine had recently sent me some ramekins, which I also thought would be perfect for changing up this recipe. The original recipe is pretty easier, especially the second time around and since it called for three bricks of cream cheese I figured it would be super easy to split the recipe into thirds. For the final episode of Downton Abbey I made Downton Abbey Scones and I had a bunch of fresh fruit left over. I decided to turn the mini cheesecakes into fresh fruit cheesecakes! 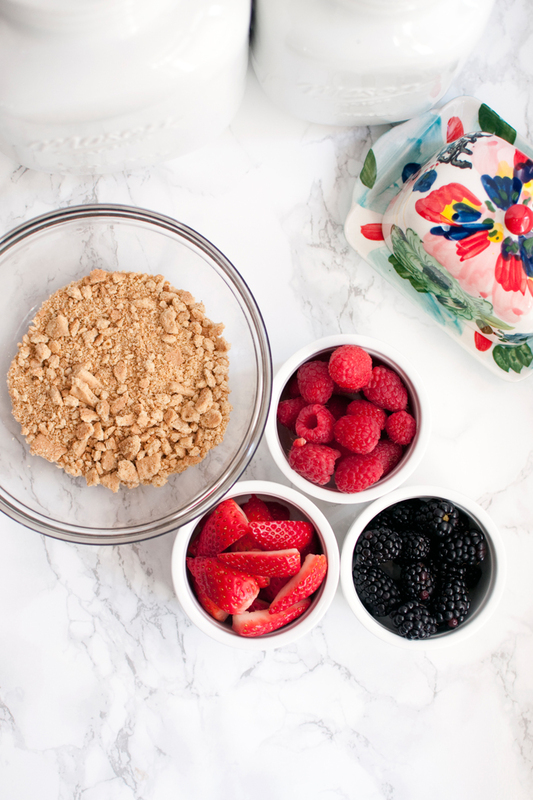 I loved the idea of piling fresh fruit on these sweet desserts. Preheat oven to 350°F. Spray the inside of four 5oz ramekins with non-stick cooking spray. In a small bowl mix together cracker crumbs, butter and sugar. Add cracker mixture to ramekins with a spoon and press firmly into bottom. Bake for 10 minutes, remove and let cool. Once your ramekins have cooled preheat oven to 325ºF and begin to prepare cream cheese mixture. In a medium bowl beat cream cheese with electric mixer for 3 minutes until smooth. Add 1/3 cup of sugar and blend for an additional minute. Add Greek yogurt and vanilla and blend for an additional minute. Remember to scrape the bottom of the bowl to ensure all is mixed well. Lastly, add the egg and beat on low until blended well. Do not over beat. Spoon cream cheese mixture into each ramekin. Place ramekins in a larger baking dish, I used a 9x13 glass baking dish. Bring a tea kettle or pot of water to boil. Place the baking dish on the bottom third shelf in the oven. Very carefully pour the boiling water into the larger baking dish. Ensure that the water comes up about 1-inch around the ramekins. Careful not to splash the water. Bake about 1 hour 30 min, or until center is almost set and edges are golden brown. Turn oven off, and open oven door slightly. Let cheesecake set in oven for 1 hour. Once an hour has passed remove the cheesecake from the oven and run a knife around the edges of each cake, careful not the left the upper crust. Let cake cool to room temperature. Refrigerate at least 4 hours or overnight. 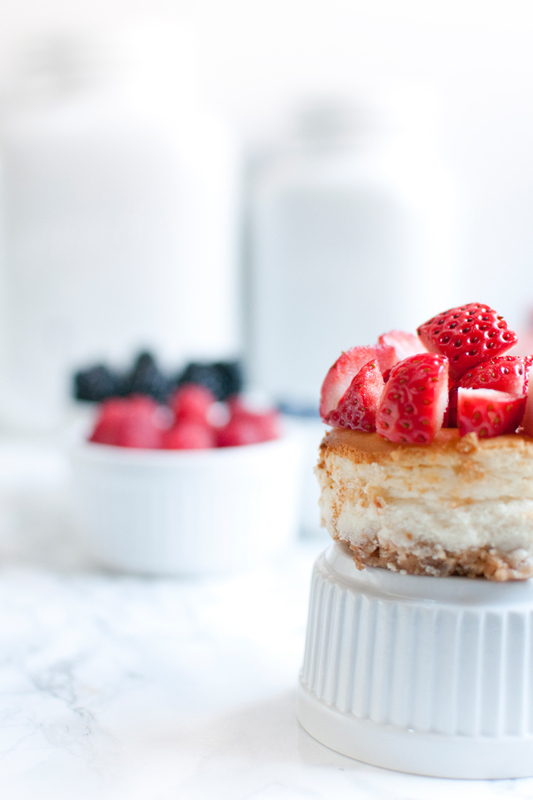 Once cheesecake has been refrigerated top with fresh fruit and enjoy! These cheesecakes are meant to be eaten straight from the ramekins. You can try to take them out of the ramekins but because they are so small it’s very difficult.